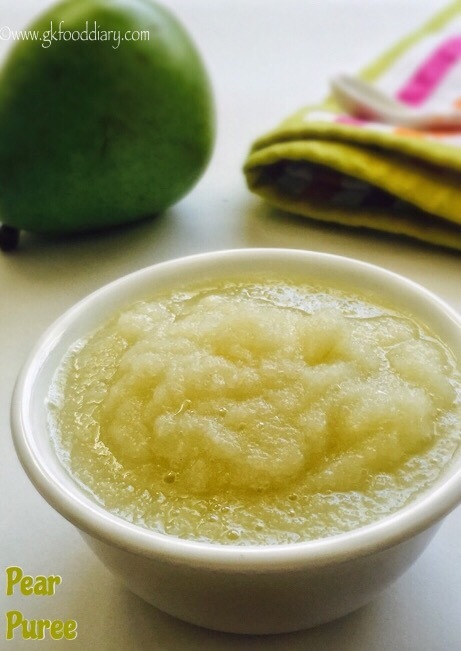 Pear makes a great first food for babies next to apple as it has smooth texture, easily digestible and less likely to cause allergies. Pears are rich in fiber and loaded with Vitamin C , its also work as great remedy to relieve baby’s constipation. Pears can be given to babies from 6 months as its less allergenic and easily digestibile. Pears can be steamed until the baby turn 8 months to ensure easier digestion. After 8 months, you can offer peeled raw pears which are cut into small pieces as a finger food to your baby. 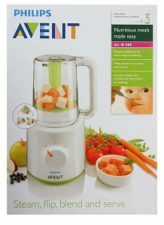 If your baby doesn’t like plain pear puree, you can add this to cereals or combine with other fruits like Apple, Banana, Avocado, sweet potato etc. Select ripen pear for baby food. A ripe pear will gently yield when you push the fruit. To ripe pear, store them outside instead of refrigerator. A well ripen pear does not need cooking but to ensure easier digestion for babies less than 8 months old, a gentle steam can be given. 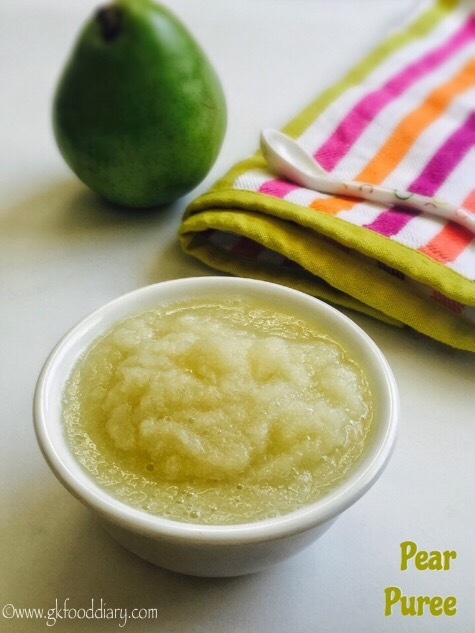 Now Let’s check how to make this easy pear puree for babies. 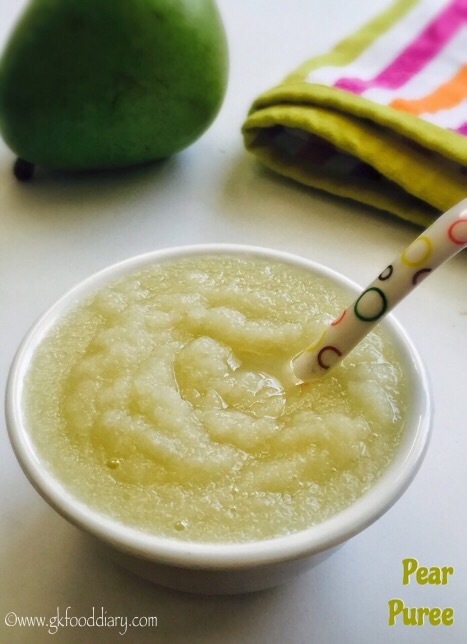 Pear puree - Easy and healthy steamed puree for babies with pears which makes a great first food for babies! Wash pears in running water well. Peel the skin off from the pear with a peeler. 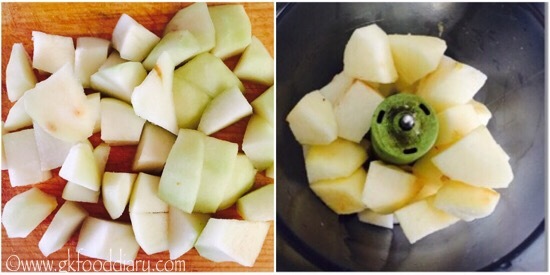 Remove the seeds in the center part after cutting the pear vertically into two pieces. Then chop them into equal size small cubes. Steam chopped pear pieces in a steamer for 5 minutes or until soft. Once the pear is steamed, it will be soft and transparent. Now blend it with little water to a smooth paste in a blender. 1. Wash pears in running water well. Peel the skin off from the pear with a peeler. 2. 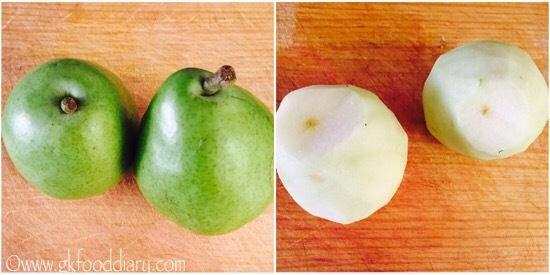 Remove the seeds in the center part after cutting the pear vertically into two pieces. Then chop them into equal size small cubes. 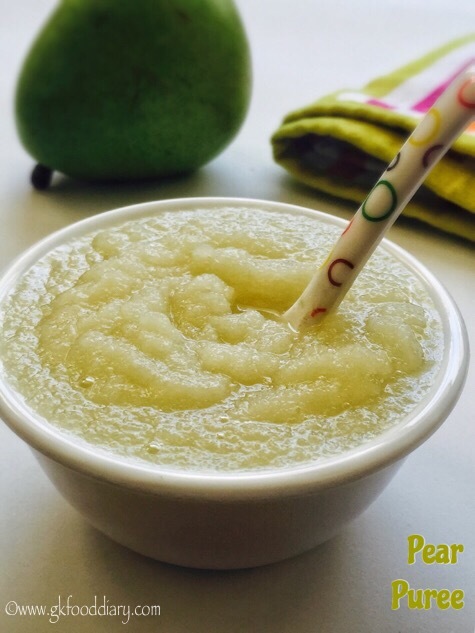 Healthy and easy pear puree is ready to feed your baby. 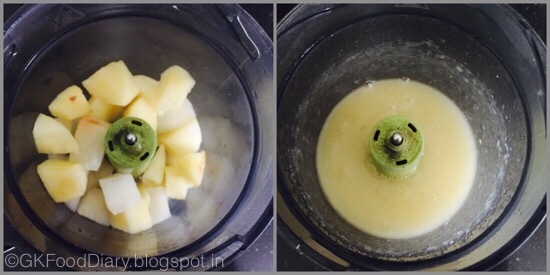 After steaming the pear, You can mash it with fork instead of blending the pears. Generally pear doesn’t cause any allergies, but check for symptoms and stop feeding your baby if you find any. Steaming is a healthy option for baby food than pressure cooking. So prefer steaming using a Idli pot or steamer.